A struggling New York photographer becomes obsessed with subway hammer enthusiast Vinnie Jones and winds up in all sorts of trouble. Who would have thought it? 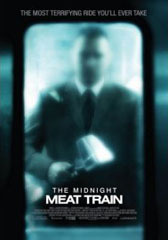 While Versus director Ryuhei Kitamura's first US feature at least avoids falling into the remake category, The Midnight Meat Train fails to scale the levels reached by his previous work. Released in UK cinemas on 31st October (why does that date ring a bell? 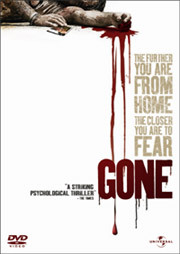 ), it will be interesting to see how mainstream multiplex audiences react to this occasionally inspired but ultimately frustrating Clive Barker adaptation. The film focuses on tofu-eating photographer Leon Kauffman (Bradley Cooper) who is desperately aiming for success with his reportage-style images of New York at night. When given the opportunity to impress prestigious gallery owner Susan Hoff (Brooke Shields) with his edgy snapshots of NY's violent underbelly, he puts his own safety on the line to get hard-hitting results. After saving a young Asian model from being sexually attacked late one night in a subway station, he discovers in the next morning's newspapers that she has gone missing (because people are officially listed missing after only 4 hours in New York apparently). Intrigued, he proceeds to investigate the disappearance, which eventually leads him to a mysterious, hulking figure dressed in a dapper grey suit and clutching a briefcase who specialises in bludgeoning unsuspecting late-night subway passengers. He looks suspiciously like the guy who used to play for Wimbledon FC, who famously grabbed Paul Gascoigne by the balls during a match. When the hulking presence, known as 'Mahogany', becomes aware of Leon's less-than-subtle interest in his unwholesome underground conduct, he captures the increasingly obsessed snapper, steals his camera, then hangs him upside down in the subway carriage like a slaughtered animal. When Leon next awakens, he finds himself in the meatpacking factory where Mahogany works, before running homeward to find a large, eight-pointed symbol carved into his chest. 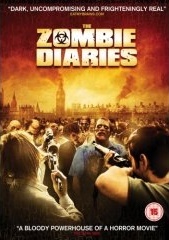 Leon's behaviour becomes increasingly erratic; he starts to eat meat instead of tofu, and he virtually rapes his loving wife, Maya (Leslie Bibb). Fearing for Leon's safety, Maya enlists the help of Leon's closest friend Jurgis (Roger Bart) to retrieve the camera from Mahogany's hotel room - needless to say, it all goes horribly wrong, as it inevitably does in such situations, and soon the final confrontation takes place on the midnight meat train. Or should I say, the 2am meat train? As you would expect from the man who brought you Versus and Azumi, Midnight Meat Train generally looks fantastic. The New York streets are rendered desolate and haunting, while the subway cars have a sterile, clinical sheen before they get splattered with victims' blood on a nightly basis. Kitamura also saves most of his appetite for visual flamboyance until the last reel, which sees Leon and Mahogany battling it out in the subway car in a technically impressive but unnecessarily protracted sequence. Unfortunately though, the use of sub-par CGI does tend to lessen the overall impact, not least in the first real subway slaughter sequence, which sees Mahogany bashing cameo-lovin' Ted Raimi's eyes out of their sockets. If you can't make it look good, then do something else! Grrr...will they ever learn!? Not having read Barker's short story, one gets the impression that there wasn't enough material to flesh this out into feature length. Maya and Jurgis seem like peripheral characters with no meat on their bones (which is probably how most characters here end up anyway); they come off as under-developed and thus our empathy as viewers is minimal. Bradley Cooper makes the leap into leading man status without making much of an impact - there isn’t exactly much wrong with his performance but it's unlikely that Leon's plight will stay with you afterwards. Vinnie Jones, on the other hand, is almost iconic in stature in the role of Mahogany, cutting a terrifying figure as the hammer-happy butcher. This is a non-speaking role for him, which is definitely a good thing, although I really wouldn’t say that to his face. Kitamura conjures a truly memorable scare moment out of Jones in a meatpacking factory scene when he catches Leon spying on him – macabre moments like this almost make the movie worthy of 98 minutes of your time. One of the main problems with this movie however is that it sometimes feels like it has been made exclusively for Barker readers. Too many questions are left unanswered. What are those growths on Mahogany's chest all about? And why does he keep them in jars in his bathroom cabinet? And, of course, the spare ending, which has the potential to puzzle the cinema-going public; factors like this come across as quite alienating and seem to be catering only for Barkerheads, while the rest of the audience rub their chins and ponder a certain soft-back purchase just to get some answers. Other drawbacks include the annoying tendency to include at least three cheesy “NOOOOOOOOO!” moments in the last ten minutes, not to mention a few other unwisely penned one-liners, like ”Step away from the meat.” But what else should we expect with a title like The Midnight Meat Train? In summary then, a bit of a mixed bag. Kitamura’s style is hard to resist at times, and certain details, like expertly conceived sound design and lashings of hard-hitting (quite literally!) gore help this meaty train rumbling along the tracks with some flair. Look out for derailment problems however when it approaches dodgy logic signals and numerous other shortcomings, which ultimately makes Midnight Meat Train look pale in comparison to pedigree subway horror like Death Line.